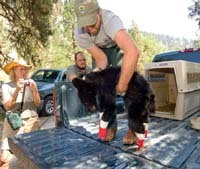 A bear orphaned by the Mustang Complex Fire near Salmon will likely remain in captivity, officials said Thursday, due to the extent of his injuries. Evin Oneale, spokesman for the Idaho Department of Fish and Game Region 3 near Nampa, said that the bear’s paws were so severely burned that by the time he recovers, he may be too accustomed to human presence. Oneale said the bear, named Boo Boo by the U.S. Forest Service employees who found him, was currently tolerating his bandages and was expected to recover. The bear has bandages on all four paws, and Oneale said animals generally attempt to chew off the bandages and lick the wounds in an attempt to heal themselves. So far, the cub isn’t doing that. The bear will likely be sent to an accredited zoo if he recovers and is habituated to people, Oneale said. The bear is eating well and is expected to make a full recovery. Forest Service employees Emily Atlas and Dan Blanchard spotted the bear in a Douglas fir tree early Saturday morning, with second-degree burns blistering his paws. Idaho Department of Fish and Game Conservation Officer Justin Williams came to Corn Creek, along the Salmon River, on Sunday morning and, along with Atlas and a member of the fire crew, captured the cub. Williams said the cub, which weighed roughly 25 pounds, had likely not eaten in days. A search for the mother proved unsuccessful. The bear was brought to State Veterinarian Mark Drew for examination at the Garden Valley Ranger Station. The agency is currently trying to find a long-term veterinary facility in which the bear can recover.